Welcome to HP Star Wars Special Edition Notebook and Gift Cards Giveaway! HP has introduced a new Star Wars Special Edition Notebook! Want to win the special edition? 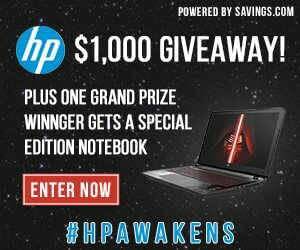 To help support the announcement that HP Inc. and Hewlett Packard Enterprises are separating into two new companies, we’ve teamed up with HP to give away $1,000 in HP Gift Cards and a Star Wars Special Edition Notebook! Sunday, November 1st at 12:00 AM ET to Monday, November 2nd at 11:59 PM ET. Open to US residents, 18+ years of age. One (1) winner will receive a Star Wars™ Special Edition Notebook, valued at $699.99. Ten (10) winners will receive a $100.00 gift card to HP. The winners will be chosen via a lottery drawing and notified on Tuesday (11/3) via the email address they used to enter.